The standard page type will give you an editor that has a page title and a single content section where you can enter the content within the page. As with each editor box within the system, you can enter any valid HTML code within the editor boxes. This page type will allow you to have multiple content sections within the page. You can re-order the sections at any time. You may also provide a link for more information and add an 80X80 thumbnail that will appear to the right of the section paragraph. The two column page editor is similar to the standard page editor, but you will have two editing boxes to enter information (one for each column). You can also change the page title and the width of the columns. This page will allow you to either upload documents or add links to the page. You will also be able to separate the items by categories. This page will create a Google Map where your visitors can enter their address and get directions to your location. This page will create a standard contact us form and show your organization's contact information. This is the page where photos are uploaded and a thumbnail is created. Make photo pages first and then add them to your album page (optional). This page will create a photo album page that will serve as an index of your photo pages on your website. You must create photo pages first. A Frequently Asked Questions page about your products and/or services is a great way to place information on your webpage for your visitors to find out more information. This page type can have multiple categories and questions. This page type will create a calendar page where you can add/modify events. Use this page type if you want to add testimonials to your website. They will be sent to the email address you have set up in the Site Config. You must approve the testimonials before they will appear. Use this page type to create a response form page. You can specify what fields and provide an e-mail address for the results. Use this page type to create a terms or glossary page. You will be able to enter the term and definition. This is a two column page that will display an RSS feed in the left column. It is a great page to use if you are pulling content from RSS feeds, you will then be able to add HTML code to your right column. This page type is used mostly by DNSTC if your site has a custom Blog and RSS feed. This page type is used to create a site map listing for your website. It can also be used as a menu system of links as well. This page is used to setup a social converstation with Facebook users. You must have a Facebook account to use this type of page. This page type is used to display the full article of a WSMS Post. It is the same as a summary page, but the first line includes the full article informaiton. 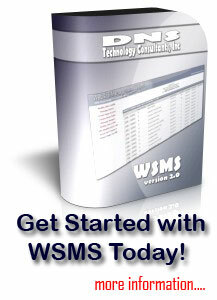 This page type is used to display a listing of WSMS Article Posts. It is the same as a summary page, but the first line includes the listing of articles. This page is used mostly by a PHP developer to add additional database functions to the website.